it's says "911" using the twin towers!! Yeah, and the secret puppeteers that control our society wanted to forewarn those of us that watch The Simpsons. Good call. Woh woh woh woh. Woh. Is that Spock at the end of the bar? Just look for this 2 videos....it was known the date of the "attack" long time ago..."september clues" & "the demolition of the twin towers"
They shouldn't have ever let osama direct that episode! 9/11 wasnt a consipracy!! check out youtube.com/RKOwens4 and he'll prove it to ya! Also check out the Super Mario Brothers movie! It shows the towers burning near the end. And that was also in 1993. What if I told you Simpsons didn't do it but knew it. That one dog from that one looney tunes cartoon with Porky Pig called it like 20 years before this was even thought of. "LOOK! IT'S THE TOWERS! THEY'RE FALLING!! AAAAAAAHHHH!!!" Also, in Johnny Bravo, there's a poster with 2 towers on fire with "COMING SOON" on top of the photo. Oh, is that your childhood i hear running away? You did it, leave The Simpsons alone. SOUTH PARK DID IT TOO! Interestingly, there was actually a terrorist bombing of the world trade center a month after this episode aired. Can I just say, the date on that is BEFORE the Twin Towers were bombed? Oh, wait, I have. No need for a question mark. FYI, it was the ninth of September, 1993. Unless I've entirely misinterpreted the purpose of this picture, which is more than likely. The little white plane in the first picture, wasn't there, it's partially photoshopped. 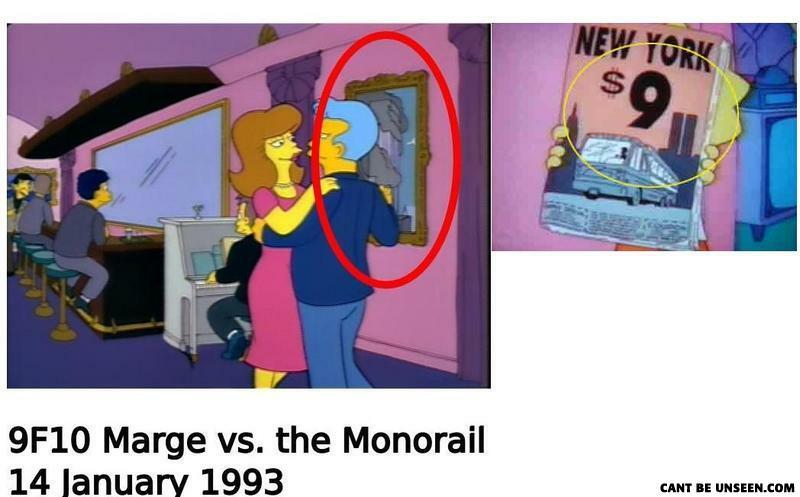 OMG, THE SIMPSONS PUT ONE OF NEW YORKS MOST FAMOUS BUILDINGS IN A FAKE MAGAZINE JUST BEFORE 9/11!!!! CONSPIRACY!!!!!! what the hell am I supposed to see? Who cares. OSAMA IS DEAD!!! - Bob, what's interesting to see in NYC ?